We’ve all seen (and maybe envied) the new prototype “millennial open office.” Edgy desks sprawl across the room, exposed brick and concrete surfaces serve as the ceilings, flooring, and walls. Sleek glass and drywall conference rooms line the space. A lot of us probably work in open offices similar to this design in some capacity and deal with all the pros and cons of these shared work spaces. While these open offices seem cool and ideal for collaborative work conversation, this open layout can actually be detrimental to productivity and concentration. (Just in case you haven’t seen the countless articles about the negative aspects of open offices, take a look here). Do you really want to hear about my trip to Cabo while you are coding the company website? Once you get over how awesome the office looks and feels on the surface, making a sales call, holding a meeting with people calling in, and even just emailing while combating constant audible distractions can actually be pretty difficult. There is a time and place to hear and be part of the latest work happenings; office culture remains and should be incredibly important in the workplace. But constant conversation and unintentional eavesdropping can definitely distract from the daily work on your plate. 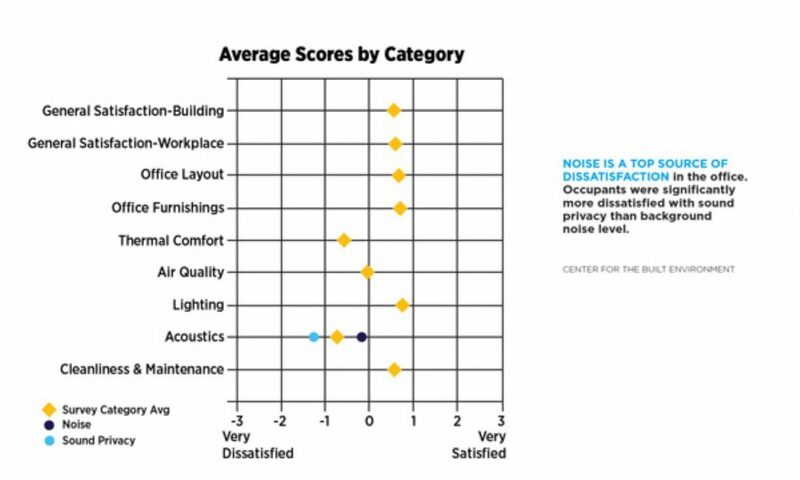 It's no surprise then that this type of poor acoustic design is a huge factor in employee unhappiness within work environments. According to one study done by the World Green Building Council, due to distraction from background noise, there can be a 66% drop in productivity in the workplace. And in meetings where people are calling or joining in via Skype or phone, echo issues in drywall and glass conference rooms can also be hazardous to productivity, when concentration on the topic being discussed is mixed with concentrating on actually hearing the person on the other end of the microphone. 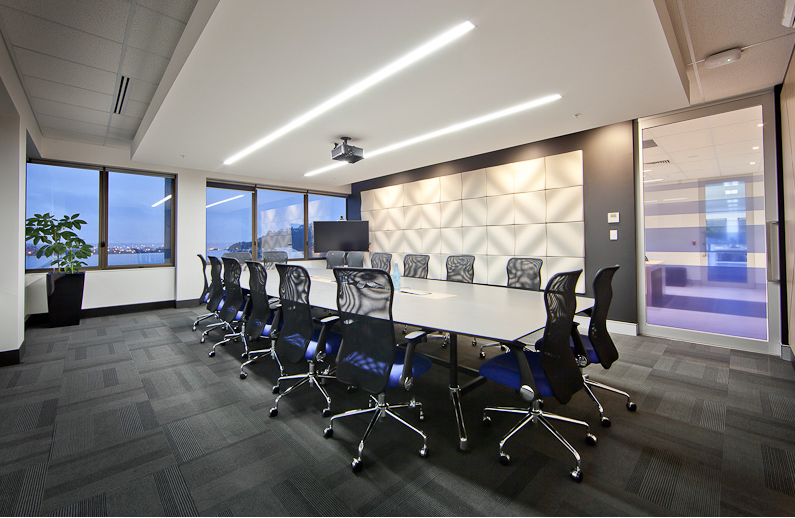 Sound reflects off of hard surfaces, even in carpeted offices. Mix in concrete walls, glass walls, and chatty coworkers, and you’ve got a total acoustical mess. So what can be done? Not a ton of wall space to install acoustic panels? Not a problem. Baffles can be hung in a variety of styles from all sorts of ceilings. And since baffles have two sides of acoustic material exposed in a room, more sound can be absorbed. These systems are designed to introduce background noise into an office space, so that overheard conversations become unintelligible, increasing privacy and productivity all at once in open offices. Install acoustic panels or partitions. A great addition to any office, acoustic panels can be used on walls or ceilings to help absorb sound and create an acoustically pleasant environment for employees. 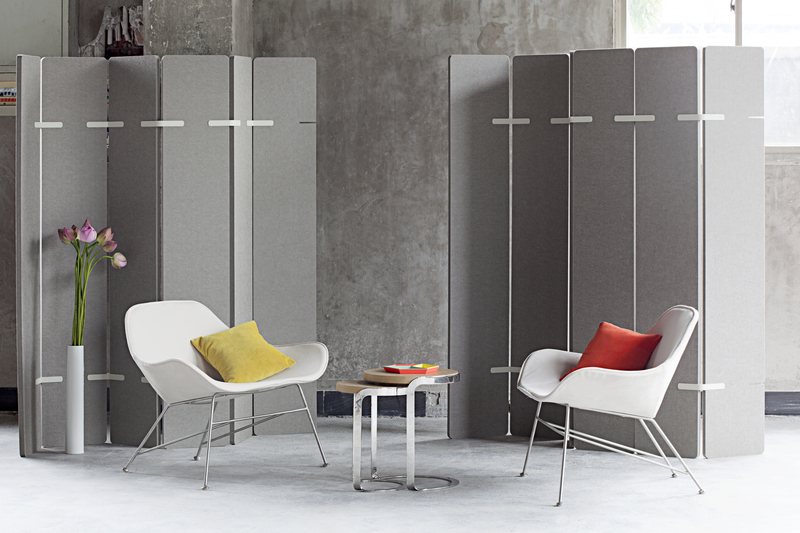 Partitions made out of softer material are also a flexible, movable solution. The ability to move and rearrange these systems allows for easy install and uninstall, based on the needs of an office space. A little outside of the norm, plants are actually great sound absorbers, which is why there are many companies offering plant walls. With air-cleaning qualities on top of sound absorption, who wouldn't want some green in the office? Plug in some noise-canceling headphones. If adding extra design elements to your space just isn't an option, try to combat the noise right at your own ears. There are many noise-canceling headphones on the market, and for a relatively small cost, concentration is right at your fingertips. Unfortunately there just isn't one fix-all solution to loud offices, but using combining a few of these tricks in your work place can significantly reduce the noise bouncing around the room. You'll be back to full-time concentration in no time.